Puerto Vallarta is a beautiful vacation destination situated between the mountains and the beaches of Banderas Bay. The city's fantastic location allows vacationers to experience endless natural attractions and outdoor activities. When you're visiting Puerto Vallarta, don't miss out on incredible attractions whether you're on a getaway with friends, a family vacation or a romantic trip. There's always something for everyone! 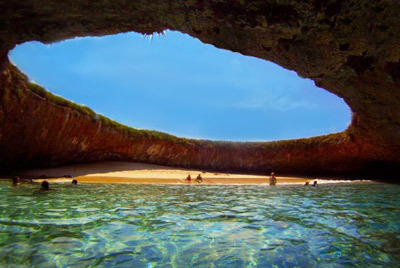 Let's start with Islas Marietas, a group of small islands that can be reached by boat from Puerto Vallarta. The islands' intriguing rock formations are a popular attraction, so make sure to plan your visit ahead of time; only a few dive tours are allowed into the area in order to protect the ecosystem from heavy boat traffic. To the south of Puerto Vallarta, you'll find Las Caletas reef, home to impressive marine life like manta rays, turtles and even dolphins! If you're lucky, you might even get to swim with sea lions. Las Caletas beach is only accessible by ocean, creating a more secluded atmosphere with just a few other visitors looking for waves and relaxation. You can also enjoy a restaurant and spa for your convenience. Las Caletas is without a doubt a must-see place in Banderas Bay. One of the top local attractions is whale watching in Puerto Vallarta during the colder months, when gray whales travel to the waters of Banderas Bay to mate. On the other hand, wild dolphins in Puerto Vallarta can be found most of the year along the coastline and in open sea. Banderas Bay and its surrounding areas also offer great spots for sport fishing in Puerto Vallarta. For travelers who prefer adventure on dry land, Puerto Vallarta is home to a wide range of jungle tours and exciting river tours close to Puerto Vallarta. Surrounded by lush vegetation, you can explore local paths on foot, on horse or even on motorbikes. Zip lines through the tree canopy are another popular, adrenaline-filled activity. Vacationers can even opt for a fun day floating along the currents of the Cuale River in an inner tube. All this and much more awaits you for your next Puerto Vallarta vacation.